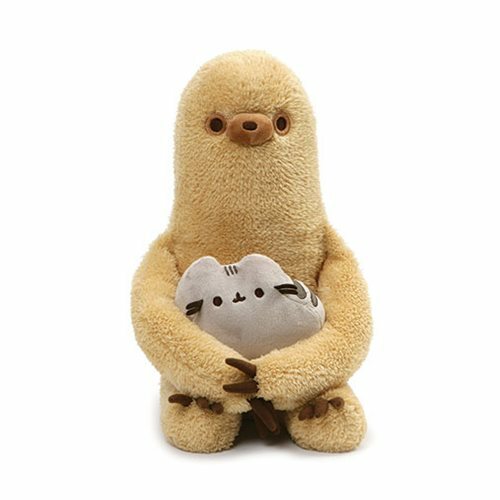 Gund is proud to present Pusheen with one of her best friends – Sloth! As a popular web comic, Pusheen brings brightness and chuckles to millions of followers in her rapidly growing online fan base. This two-in-one plush features a 13-inch tall Sloth, a fan favorite who often pops up in the web comic to celebrate holidays with Pusheen and her friends, holding a detachable Pusheen plush. Surface-washable for easy cleaning. Measures about 13-inches tall x 8-inches long x 7-inches wide. Ages 1 and up.